How Can We Reach Them With the Gospel? 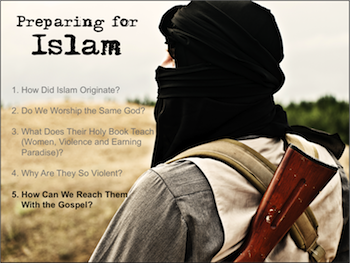 As the influence of Islam grows around us, Christians must be prepared for more than physical persecution, Christians must also be ready for rich evangelistic opportunities. For over 1,500 years, the Muslim religion has been trapped in the inky blackness of the Dark Ages. The liberating light of the Gospel is perfect for such a time as this! In order to reason effectively with a follower of Islam, the establishment of common ground is essential. Read the following passage from their holy book. Buy your own copy of the Qur’an and mark the page for easy reference. This passage is key to establishing authority. Since the Qur’an was delivered 600 years after the Bible was completed, Muslims believe that it is a more accurate version of God’s will for man. Although the Qur’an says many times that the Bible is from God, Muslims believe that God failed to protect the biblical message from the tampering of corrupted false interpreters. However, a more likely explanation comes from the Encyclopedia Britannica. According to early publications (before Islamic political correctness), there is no evidence that Muhammad could read; therefore, his dependence on oral communication may explain some of his misconceptions about biblical stories. (Encyclopedia Britannica 13:479) While Jewish, Christian, and pagan traders conversed around the campfires, Muhammad probably listened to their favorite stories with wide-eyed fascination. As tales evolved, names, times, places, and events became confused and were later added to the Qur’anic writings. The Qur’an says that Pharaoh’s wife adopted Moses (Qur’an 28:9) when the Bible says it was his daughter. The Qur’an claims that Haman lived during the time of Moses and helped Pharaoh build the tower of Babel. (Qur’an 28:38) The Bible says that Haman lived during the time of Esther and built a tower used for his own execution. Not only does the Qur’an contradict many biblical accounts, it even contradicts itself. When one adds up the days in Qur’an 41:9, 10, and 12, it is found that the Qur’an claims that God created the world in 8 days. Yet, in Qur’an 10:3, it says that He created the heavens and the earth in 6 days. Consider also the confusion brought on by the ever-changing Arabic language. Every reader is here challenged to compare two separate translations of the Qur’an. The confusing differences in wording and translations will be obvious. The message of the Qur'an and other teachings of Islam are under constant update to meet the pressures of political correctness. The Qur'an and the Hadith are written in a living language. The message is, therefore, susceptible to the fickle, ever-ongoing changes of political correctness. "Men have authority over women because God has made one superior to the other, and because they spend their money to maintain them. Good women are obedient. They guard their unseen parts because God has guarded them. As for those from whom you fear disobedience, admonish them, forsake them in beds apart, and beat them. Then if they obey you, take no further action against them. Surely God is high, supreme." Now notice a later, more politically correct translation. "Men are the support of women as God gives some more means than others, and because they spend of their wealth (to provide for them). So women who are virtuous are obedient to God and guard the hidden as God has guarded it. As for women you feel are averse, talk to them suasively; then leave them alone in bed (without molesting them) and go to bed with them (when they are willing). If they open out to you, you do not have an excuse for blaming them. Surely God is sublime and great." Unlike the ever-fickle updates of the Qur’an, which are given to appease political correctness, the New Testament message has been locked in time. Shortly after the Bible was completed near the end of the First Century, God arranged for an amazing event to occur. Other world languages replaced the First Century Greek language of the New Testament. In effect, the Greek language died. The death of the New Testament language caused the meanings of each word to be frozen in time. Unlike the living languages of today that evolve with every passing generation (example: the English word gay), the language of the New Testament has been miraculously secured forever. Translators often attempt to abuse the original message but, given the Divine safeguard of a dead language, the reference point of the New Testament never changes. Did you know that some 40 different men who spoke at least 3 different languages wrote the Bible over a period of about 1600 years? Did you know that ancient parts of the Bible refer to events and facts that would not occur or be proven to be true until five or six hundred years later? You must admit that the Bible is an amazing book. Despite the enormous odds against it, the Bible’s harmony and accuracy has never been matched. Judaism tried to destroy the Bible. In Jeremiah 36:22-23, we find that Jehoiakim tried to eliminate its message, but he failed. In 100 B.C., Antiochus IV tried to destroy the Bible, but he failed. And shortly after Jesus ascended back into Heaven, the Jewish Sanhedrin forbade preaching in Jesus’ name. Yet today, the book that contains His life-story is read in nearly every corner of the world. Moslems tried to destroy the Bible. In 732 A.D., they attempted to eliminate all Bibles and kill all Christians, but they failed. Catholicism tried to destroy the Bible. In 1494-1516 A.D., Ferdinand and Isabella forbade the people to have Bibles. In 1600, Ferdinand II caused ten thousand Bibles to be burned in his attempt to destroy it. In 1637, Jesuits caused sixty thousand Bibles to be burned. In 1713, Pope Clemont II condemned Bible reading. In 1844, Pope Gregory XVI said that Bible societies were guilty of the greatest crime against the church. The French skeptic, Voltaire, once said, “In less than one hundred years the Bible will be discarded and Christianity will be swept from the earth.” One hundred years later, Voltaire was dead and his house was being used as a depot for the International Bible Society. Because of the eternal, indestructible, ever harmonious nature of this book, the Bible has never lost its place on the bestselling list! In fact, there is no other book throughout all history that remotely compares with the popularity of the Bible. Parts of the Bible have been translated into more than 1300 languages. About 75 million Bibles are sold each year. Well over one billion copies of this book have been printed. There have been enough Bibles printed to make a solid ribbon of Bibles all the way around the world, not just once or twice, but three times. Conclusions: If Muhammad is correct, then we must conclude that God failed to protect His Holy Word, history is in error, and the accuracy of the most documented book in all of history is doubtful. On the other hand, if the Torah and the Gospels are correct, then they stand in judgment of the Qur’an’s inaccuracies and the entirety of the Islamic faith crumbles. If Muhammad is correct, then we must conclude that God failed to protect His Holy Word, history is in error, and the accuracy of the most documented book in all of history is doubtful. On the other hand, if the Torah and the Gospels are correct, then they stand in judgment of the Qur'an's inaccuracies and the entirety of the Islamic faith crumbles. Missed the first six lessons of this series? Take a look! Back to Top of "How Can We Reach Them With the Gospel? (Part One)"